SAN FRANCISCO — With the financial crisis dimming solar’s prospects to become a significant source of renewable energy, utility giant PG&E on Tuesday said it will spend $1.4 billion over five years to install 250 megawatts’ worth of photovoltaic panels in California while contracting with private developers for another 250 megawatts. PG&E chief executive Peter Darbee said the utility is also prepared to be a “green knight,” rescuing distressed big centralized solar power plant projects by providing financing so they can get built. PG&E’s (PCG) move to take a direct role in obtaining the renewable energy it needs to comply with California’s global warming laws could be big business for solar module panel makers and installers like SunPower (SPWRA), Suntech (STP) and First Solar (FSLR). The action was prompted in part by a change in the tax laws that lets utilities claim a 30% investment tax credit for solar projects. Fong Wan, PG&E’s vice president for energy procurement, said most of the 500 megawatts of solar panels will be installed on the ground in arrays of between one and 20 megawatts at utility substations or on other PG&E-owned property. (The utility is one of California’s largest landowners.) A small portion may be installed on rooftops, he said. PG&E said the solar initiative will generate enough electricity to power 150,000 homes and will provide 1.3% of the utility’s electricity supply. The California Public Utilities Commission must approve PG&E’s solar initiative, which Wan estimated would add about 32 cents to the average monthly utility bill. An $875 million program unveiled by Southern California Edison (EIX) last year to install 250 megawatts of utility-owned rooftop solar panels has run into opposition from solar companies that argue it is anti-competitive and from consumer advocates who contend the price is too high. The state’s third big utility, San Diego Gas & Electric (SRE), has also proposed a rooftop solar program. Wan acknowledged that objections to Edison led PG&E to design its program so that private developers would have a 50% stake in the initiative. PG&E will sign 20-year power purchase agreements for privately owned solar installations. PG&E will also need regulators’ approval to inject equity financing into companies developing big solar power plants. The utility has signed power purchase agreements for up to 2,400 megawatts of electricity to be produced by solar thermal and photovoltaic power plants to be built by companies like Ausra, BrightSource Energy, OptiSolar and SunPower. “We are looking at the least risky and most developed opportunities to see where we can be the most helpful,” Darbee said. The credit crunch is taking a toll on the United States’ nascent solar industry, scuttling big renewable energy projects and curtailing expansion plans, solar executives said Wednesday as they proposed the inclusion of green incentives in the Obama economic stimulus plan. 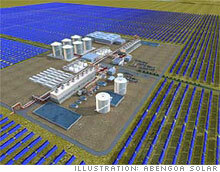 Spanish energy giant Abengoa, for instance, has put on hold plans to build its 280-megawatt Solana solar power plant outside Phoenix to supply electricity to utility Arizona Public Service (PNW) in a $4 billion deal, said Fred Morse, senior advisor to Abengoa Solar. “We have serious issues getting financing,” said Morse during a conference call held by the Solar Energy Industries Association. Congress in October passed a 30% investment tax credit crucial to the solar industry. But Wall Street’s meltdown has scared off investors that normally would finance large solar projects in exchange for the tax credits. Suntech America president Roger Efird said that after Congress passed the investment tax credit, the Chinese solar cell maker immediately doubled its sales force in the U.S. That expansion has now hit a wall. “Plans to double our sales force by the end of 2009 are currently on hold, primarily because business has slowed in fourth quarter because of the credit crunch,” he said. “We had been considering establishing manufacturing in the U.S. The timing of those plans depend on the growth of the market in the U.S. and how long it takes to get through this downturn.” Suntech’s (STP) stock – like those of rivals SunPower (SPWRA) and First Solar (FSLR) – has been walloped by the market chaos and is down 94% from its 52-week high. Ron Kenedi of Sharp Solar said the dealers and installers who buy the Japanese solar module maker’s products have had a hard time securing credit to finance their operations. In response, the solar industry’s trade group on Wednesday proposed that the federal government cut through the credit crunch by adopting tax and investment policies to stimulate the solar sector and create 1 million jobs. The centerpiece of the plan is a $10 billion program to install 4,000 megawatts of solar energy on federal buildings and at military installations. “The Department of Defense alone could jump start this industry and it could have widespread impact on the use of solar, similar to what it did for the Internet,” said Nancy Bacon, an executive with Michigan thin-film solar cell maker Energy Conversion Devices (ENER). The Solar Energy Industries Association also wants Congress to enact a 30% tax refundable tax credit for the purchase of solar manufacturing equipment to encourage solar companies to build their factories in the U.S. That would result in an estimated 315,000 new jobs. Making the current investment tax credit refundable would also help loosen up financing for solar projects, the association said. Establishment of a national Renewable Portfolio Standard that would require states to obtain a minimum of 10% of their electricity from green sources by 2012 and 25% by 2025, with 30% of the total coming from solar. Rapid deployment of new transmission lines to connect cities to remote areas where wind and solar power is typically produced. 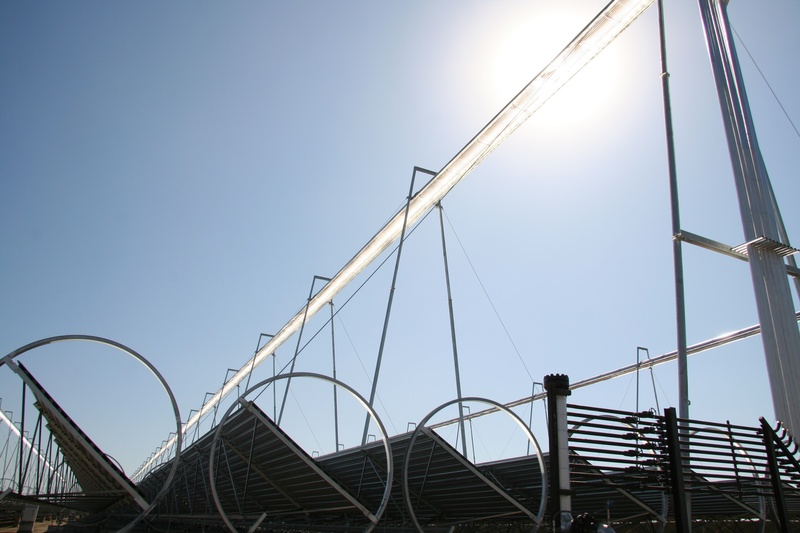 Expedited approval of solar power plant projects on federal land in the Southwest. Creation of an Office of Renewable Energy in President-elect Obama’s office to coordinate the procurement and permitting of solar power and transmission lines. President-elect Barack Obama may dismiss notions of a New New Deal to stave off a Great Depression 2.0, but signs of a Rooseveltian shift in thinking abound. 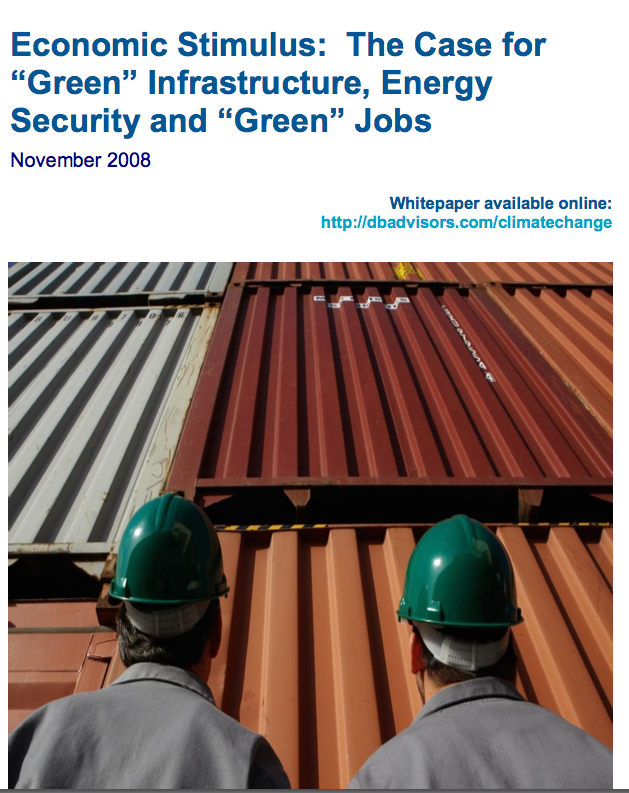 Case in point: This week, Deutsche Bank called for the establishment of a “national infrastructure bank” to create “green” jobs, fight global warming and ensure U.S. energy independence by investing in an array of projects – from energy efficiency to upgrading the Eisenhower-era power grid to large-scale renewable energy power plants. The idea of a national infrastructure bank is not new – versions have been proposed by Obama and Senators Chris Dodd (D-Conn.) and Chuck Hagel (R-Neb.) to finance the repair of the nation’s crumbling highways, water systems and cities. Deutsche’s twist is to give such an institution a green mission. “We believe this confluence opens up an historic opportunity for a new U.S. administration and Congress to take a global leadership position on the issue of the environment and energy security, while addressing current financial problems,” wrote Deutsche Bank’s Climate Change Investment Research team in its report. “We’re calling for the national infrastructure bank to go green because in the long run it will save us money and create more jobs,” Deutsche senior investment analyst Bruce Kahn told Green Wombat. He says Deutsche Bank is not putting a dollar figure on the capitalization of such bank, but the report notes others have suggested a $100 billion investment would generate two million green jobs. Deutsche Bank (DB) recommends a green infrastructure bank focus on energy efficiency, the transmission grid, renewable energy and public transportation. The green bank would dispense federal funding, make grants to states and cities, issue loans to governments and companies, underwrite public and private bonds, and provide tax credits for public and private projects. In Deutsche Bank’s analysis, the biggest bang for the buck would come from a massive retrofit program to increase the energy efficiency of the nation’s commercial buildings and make sure the 1.8 million new homes constructed every year are green. Buildings consume as much as 50% of the electricity generated in urban areas and emit about 20% of the country’s greenhouse gases. The work of installing energy-efficient heating, lighting and air conditioning systems is labor intensive and would spike demand for green building materials. Upgrading and digitizing the power grid to create a “transmission super highway” to bring solar and wind energy from the deserts and Great Plains to the cities could generate as many as 500,000 jobs, according to an estimate by the American Wind Energy Association. The price tag to modernize the grid: $450 billion over the next 15 years by New Energy Finance’s estimate. One area given short shrift by the Deutsche report is how a green infrastructure bank would support large-scale renewable energy power plants. Wind farms and solar power stations typically require billions of dollars in financing to get built and rely on investors buying the tax credits the projects generate. Those investors have been in short supply thanks to the credit crunch and the collapse of the Wall Street banks that often put up the cash for such deals. “Everyone’s lost money, there’s no tax equity to be had,” says Kahn. “But we expect that tax credit equity investors will return to the market, not next month, but in the next couple of years.” Kahn says an infrastructure bank could support green energy power plant projects through loans and loan guarantees. A green bank would also be good business for Deutsche Bank. The wind, solar and geothermal industries have wasted no time pressing the incoming Obama administration to implement an alternative energy agenda to spur investment and create jobs. During a conference call Thursday, the leaders of the Solar Energy Industries Association, American Wind Energy Association and other trade groups lobbied for a plethora of legislation and policy initiatives. None of these proposals are new, but given Barack Obama’s campaign promises to promote alternative energy and the strengthened Democratic majority in Congress, the industry has the best chance in many years of seeing this wish list made real. A major infrastructure program to upgrade the transmission grid so wind, solar and geothermal energy can be transmitted from the remote areas where it is produced to major cities. Obama advisor Eric Schmidt, CEO of Google (GOOG), recently joined with General Electric (GE) chief Jeff Immelt to launch a joint initiative to develop such smart grid technology as well as push for policy changes in Washington to allow the widespread deployment of renewable energy by rebuilding the nation’s transmission system. Mandate that the federal government – the nation’s single largest consumer of electricity – obtain more energy from renewable sources. “If the administration and Congress can quickly implement these policies, renewable energy growth will help turn around the economic decline while at the same time addressing some of our most pressing national security and environmental problems,” the green energy trade groups said in a joint statement. No doubt those measures are crucial to spurring development of renewable energy and creating green collar jobs. But the major obstacle confronting the alt energy industry right now is the credit crunch that is choking off financing for big wind and solar projects and scaring away investors from more cutting-edge but potentially promising green technologies. A focus by President Obama and Congress on restoring confidence in the financial system will most likely do the most for green investment as well as restore luster to battered renewable energy stocks like First Solar (FSLR), SunPower (SPWRA) and Suntech (STP).